Stats, facts, and figures—we all love data, and it certainly helps make content all the more powerful. Data, when used properly, makes an argument more compelling, underscores a position, and adds relevancy and authenticity to a story. Yet we’ve all seen infographics, slides, and blog posts so cluttered with a hodgepodge of complex charts and figures, they actually depreciate the effectiveness of the content and the message. How do you balance data, design, and messaging to tell a stronger story? It starts by thinking like a journalist, uncovering the deeper story, and abstaining from the urge to create data-loaded visuals. Journalists live by the long held “Five Ws and One H” rule. That is, every good story answers the who, what, when, where, why, and how. The “who” are the characters in the story. The “what” are the events or actions, or in this case, the data and facts. 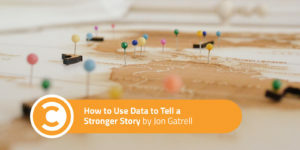 You must be able to draw connection between the characters and the data you are presenting. “When” reveals the time frame, and “where” identifies the place. “Why” is the cause for the events or findings, and finally, “how” is the way in which something happened. These all make your data relevant and concrete. Whether you’re selling an idea to your target audience or informing your team about a new initiative, don’t compromise the art of storytelling just to showcase data. To successfully uncover the five Ws and one H, you have to mine the data. Often, the deeper you dig into your findings, the more likely you’ll discover an amazing story, or maybe even two. Enlist your team to assist in this process. Doing so will bring more, varied perspectives to the table and reduce the likelihood of missing a key point. Content with data sometimes fails because the findings or facts are placed before the story. When looking over the data, the key is to identify that bigger story. For example, maybe you conducted a study on trends in product development over the last five years and found in the last year, there was a major influx of software products for geriatric care introduced to the market. Why? Does the increase point to an aging population or a need for more specialized care? Are health care providers challenged with new demands with geriatric patients? The five Ws and the H of these findings will give you the story, and the data will add authenticity. One shining example of this is The Coca-Cola Company’s “Content 2020” animated whiteboard video. Then-Vice President of Global Advertising Strategy, Jonathan Mildenhall, outlined the brand’s plan to focus on storytelling, which he animated, set to music, and sprinkled with data. Rather than simply put this together in 50-page plan, he illustrated the point with the who, what, when, where, why, and how. Every good story has an element of emotion. It’s what connects the reader to story. Once you’ve identified the emotional hook, think about how it can be further supported by data. Maybe the facts reveal a major challenge the character in the story needs to overcome. Vidyard, for example, does this part well with their infographics. “The modern marketers mission: Become an agent of ROI” presents the all-to-common challenge many marketers face: not being able to deliver satisfying metrics to demonstrate ROI. The infographic has a central character, a challenge, and a villain (“The Big Boss”), which they support with data. Once you’ve personalized it, begin to reveal core data to support your point, then sprinkle in qualitative data. Of course, to truly know what is going to resonate most with your audience, you have to know who they are. Having a solid set of personas will better position you to understand what they care about. One of the earliest forms of storytelling was oral storytelling, which likely included gesture and expression. Then, to help the storyteller remember the story, storytellers turned to symbols painted on cave walls. Some imagery can communicate a message instantly and make it memorable, while others require the viewer to do too much work, dissecting the information and deciphering their own conclusion. Images should reduce the complexity of bulky data. Carefully select data points and design elements to relay the story at a glance. For instance, we recently released our Product Management and Marketing Survey Results and opted for a superhero theme to communicate our main findings and our message: that product managers and marketers are having to juggle more than ever in bringing their products to market. The superheroes became the characters that product managers and marketers could relate to. Thought bubbles attached to the characters (recreating the “POW!” and “BAM!” graphics from old comic books) were used to illustrate facts and figures rather than more traditional pie charts, bar charts, and graphs. The placement of each data point was also important to build the story and flow. Keep in mind that visuals should layer in additional information without detracting from the main message. Aim to limit major facts or issues in your story to just two to three—the brain typically can’t retain more than three to five major facts or concepts. While data lends authenticity to a story, when the story is overwhelmed by it, and context takes a back seat, you run the risk of completely losing your audience.